Have you ever heard the phrase "Everything's better deep fried"? Well I thought I'd put it to the test in my entryway by using an old industrial-sized deep fryer basket found at a local restaurant supply house. I put it to work holding vases of flowers to greet company. Let me know if you think the "everything's better..." statement holds true. We Have a JUNK BEAUTIFUL Winner!! On this Valentine's Day Eve, I'd like to thank each and every one of you that participated in my junk giveaway! I'm happy to hear so many of you share my love of junk. As you can see, I had my junk assistants at hand to help with the drawing. Eileen, at ruralwisconsin.blogspot.com! Yay Eileen, and welcome to my blog! Please email me at junksophisticate@yahoo.com with your complete address. Eileen said "The junk of my dreams is one of those old lawyer's book cabinets with glass doors that come down in front of the shelves. The cabinets I've see so far are in much too good shape to be affordable!" Sounds wonderful! Go check out her blog...filled with gorgeous architectural homes and buildings and other great things. I plan on getting to know each of you a bit better by perusing your blogs and sharing junk stories with all of you. Your junk items of your dreams were a blast to read! I also have an update for those that wish to purchase the JUNK BEAUTIFUL mag/DVD combo. Sue spoke with her publisher and was told "Our distributors do not carry it online. The best bet to find copies would be Borders and Barnes and Noble, Lowes and Home Depot, and possibly some supermarkets." I hope this is helpful to you! Supplies needed for tray and piano roll luminaries: One piano roll (or remnant), vintage scrolly gold frame, spray paint, glass cylinders, ribbon, glue and additional embellishments. Directions - Just spray your frame, add your papers and piano roll, and add lettering to convey your message. The luminaries are made simply by decoupaging the piano roll right onto the glass. I top coated it with two coats of decoupage. Add grosgrain or velvet ribbon as trim. They look gorgeous lit up with tea lights. I think this project is tray chic! Can I just say how thrilled I am for those that have commented on my giveaway! I really appreciate you taking the time to do so and it has been so much fun reading about everyone's dream junk piece(s)! Keep them coming! 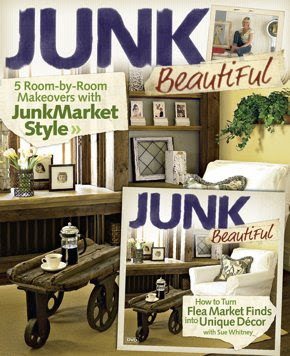 For those that are having a hard time locating the Junk Beautiful magazine/DVD combo in your area, two of the largest places I've seen it are Home Depot and Borders Bookstore. I will do my best to see what is the best online method to get it to you. Please stay tuned. Nope. I haven't reached my 100th post (or even my 50th for that matter), but I thought it would be fun to have a giveaway! Junkers love curbside freebies, and this Valentine's Day week is all about love, right? Well consider this an internet freebie chock full of junk love...and it doesn't even involve your typical spam. This will be one piece of "Junk Mail" you'll love to receive! I got a copy of the latest edition of JUNKMARKET Style's Junk Beautiful magazine early last month and knew I wanted to go this direction with my giveaway. So I took my weekly trip to Home Depot to pick up another copy to give to a junk friend on my blog. The added kicker is the DVD is included with the magazine purchase! Let me tell you it is a lot of fun watching one of the most well-known junkmaster's in the business, Sue Whitney, giving a tour of her lovely junk-laden home. The DVD also includes simple projects completed by Sue along with Kimberly Melamed as well as a junking trip they took to the flea market and so much more. Fun stuff, I tell you! Would you like a chance to win a copy for yourself? Well, here goes! All I ask is that you leave a comment on this post...it's just that simple! If you'd like to add to the fun, list the JUNK item of your dreams in your comment and let us know if you already found it, or if it's still on your wishlist. If you mention my giveaway on your blog and link back to me, email me at junksophisticate@yahoo.com and I will add an additional entry for you good towards the giveaway. Followers with a comment will also get an added entry. So by becoming a junk friend follower your name gets tossed into my galvanized bucket once again! To do so, just add yourself on the left side of the screen. Drawing to be held Friday, February 13th at 9:00am EST. I will announce the winner on my blog by 10:00am the same day so please check back to see if it is you! The winner must claim their junk gift and provide contact information by Tuesday, February 17th. If not claimed, a new drawing will be held, Wednesday, February 18th to locate another junker. p.s. The junk item of my dreams is a large old apothecary cabinet loaded with drawers you can label! I haven't found one I can afford yet, but will be in junk heaven when I do!